Offering you a complete choice of products which include die lining machine for circular can making. 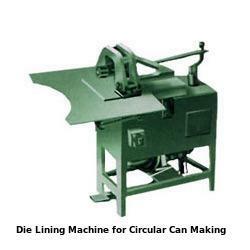 We manufacture and supply durable range of Die Lining Machine for Circular Can Making. These machines are manufactured from high quality raw materials, which are sourced from the most authentic and reliable vendors. Die Lining Machine is useful to provide rubber lining in the flanges. These are manually operated machines. Die Lining Machine can handle rectangular and square tins. Our machine is cost effective. Looking for Die Lining Machine for Circular Can Making ?